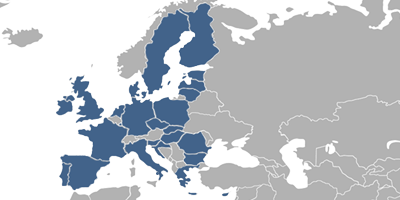 Registration of the European Union trademark (former Community Trademark) is conducted via filing one application directly with the European Union Intellectual Property Office (EUIPO) and is valid in 28 European Union countries: Austria, Belgium, Bulgaria, Croatia, Cyprus, Czech Republic, Denmark, Estonia, Finland, France, Germany, Greece, Hungary, Ireland, Italy, Latvia, Lithuania, Luxembourg, Malta, the Netherlands, Poland, Portugal, Romania, Slovakia, Slovenia, Spain, Sweden, and the United Kingdom. Fees associated with filing a European Union trademark application with EUIPO as well as other trademark fees are available in the fee calculator. The term for filing a European Union trademark application claiming priority is six months from the priority date. An application for an EU trademark should be filed at the Office and include at least a request for the registration of a trademark, information identifying the applicant; a list of the goods or services in respect of which the registration is requested; a representation of the trademark. European trademark applications (EUTM applications) can be filed in English, French, German, Italian or Spanish. A second language must be indicated by the applicant which will be the language of proceedings for opposition, revocation or invalidity proceedings. Multiple-class EUTM applications are possible. A copy of the priority document should be submitted to the Office within three months from filing the application. Currently, the legislation of the EUIPO does not require submitting a Power of Attorney when filing an EUTM application. A European Union trademark application may be opposed by any interested person within three months from the publication of a European Union trademark application. There is no official grant fee stipulated for European Union trademarks. EU trademark is valid for ten years from the filing date and can be renewed for successive ten-year periods an indefinite number of times. The proprietor of the trademark may request the renewal of the term during a six-month period prior to expiry date of trademark protection. Registration of the trademark may be renewed within six months after expiry of the term of legal protection of the trademark. A corresponding request must be submitted together with supplementary fee. The trademark right registered in the European Union may be revoked if it has not been used within an interrupted 5-year period following its registration. A foreign applicant may be represented before the Office by any legal practitioner qualified in one of the member states of the European Economic Area which includes the EU countries, Iceland, Liechtenstein, and Norway. Words, logos, devices or other distinctive features which can be represented graphically. 1. Online Search Database for European Union Trademarks. 2. In case of refusal of trademark registration in one of the indicated countries, the refusal will have effect on the territory of all member-countries.